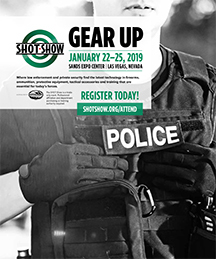 The SHOT Show is industry's largest dedicated exhibit for firearms, protective equipment and tactical accessories to service law enforcement, armed forces, SWAT and private security. More than 2,000 total exhibits! Everything you need to know about how the 2019 SHOT Show may benefit your agency is outlined in our 2019 Tactical Planner. View details for the exhibits, the networking, the training and more. Be one of the first to see the hottest new products on the market. The New Product Center is your best resource to explore new firearms and protective equipment. Through the SHOT Show mobile app, you can scan the products you like in the New Product Center, and quickly receive product details, manufacturer information, and exhibit location. Developed to introduce manufacturers/suppliers never before seen at the SHOT Show, the overwhelmingly popular NEXT Pavilion is the spot for evaluating innovative technology for your agency. No other event gives you access to such a diversified group of professionals and agencies in the law enforcement and defense industry. When you attend the SHOT Show, you collaborate face-to-face with other armed services, law enforcement tactical divisions and hi-tech private security organizations. The LEEP program, focuses on protection measures and tactical execution specifically for law enforcement units. Learn from leading industry training organizations such as the National Tactical Officers Association and industry product authorities. Upon completion, LEEP participants receive a Certificate of Attendance confirming course participation, which can be used to document training. Need Approval on Your Travel Request? We make it easier to fill out travel request forms. Our justification letter demonstrates the value of sending someone from your agency to participate in this year's show. Download our sample letter and paste it into your official documentation!